Kootu is a wholesome preparation, easily digestible and suitable for both young and the old! 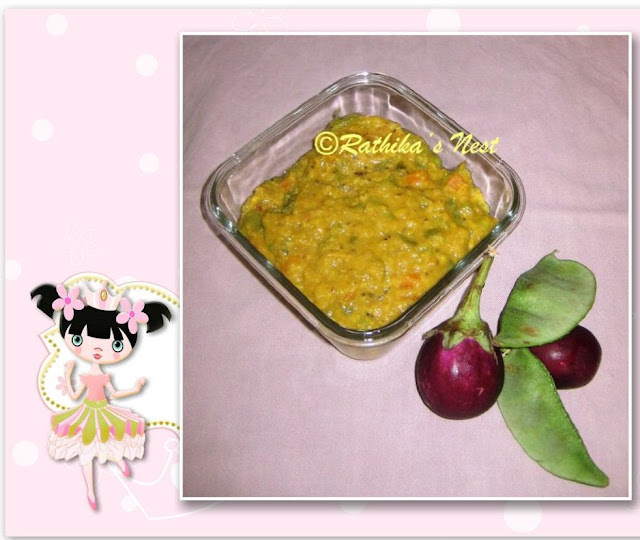 I have already shared several kootu recipes on Rathika’s Nest, but it has been long time since I shared a new one! Today I wish to share a recipe that you can use to make kootu with any combination of vegetables that you may have in the refrigerator. *You can use a combination of three or more of these vegetables — broad beans, chow-chow, brinjal (eggplant), cluster beans, French beans, snake gourd, and carrot. Method: Pressure cook toor dhal with 1 teacup or 200ml of water for 6 minutes or 6 whistles. Heat cooking oil in a kadai and shallow fry coriander seeds, Bengal gram dhal, urad dhal, and red chillies till the dhals turn golden brown in color. Grind the fried ingredients with coconut and asafoetida into a smooth paste. Keep aside. Cook cut vegetables with turmeric powder, salt and ¼ teacup (50 ml) of water in a kadai on low flame. Once the vegetables are done, add the cooked dhal and required salt and mix well. Simmer for 2 minutes. Now add the ground paste, blend together and bring it to boil. Switch off the fire. Heat coconut oil in a tadka pan, add mustard seeds, when they start to sputter, add urad dhal and fry till the dhal turns golden brown. Remove from fire. Add the seasonings and curry leaves to the kootu. Serve hot with rice and rasam/ kuzhambu.